This Grain Free Gluten Free Bread is so quick and easy for all the times you want to add a slice of bread to your meal or make an open faced sandwich. I got the idea from my Trim Healthy Mama book for making bread in the microwave. I love Trim Healthy Mama. Check out my review here. 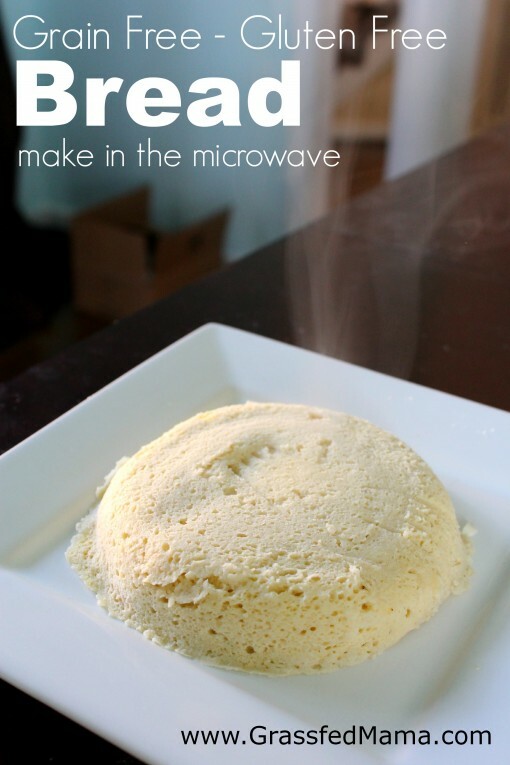 You don’t have to use the microwave, you can bake this in the oven too. Sometimes life gets busy and I forget to plan ahead… that’s when I really like having recipes like this that I can make in a hurry. I am really in love with baking with coconut flour right now. The texture that it provides for gluten free baking is perfect. I like the combination of almond flour and coconut flour together in this Grain free Gluten free quick bread recipe. This recipe could be used as a crust for a quick pizza, a grilled cheese, any open faced sandwich. It is so flexible! You can change up the seasonings to match your meal with garlic powder, onion, and Italian seasonings. This is a good gluten free bread to pair with a salad or a soup. We love to eat bread with our eggs. 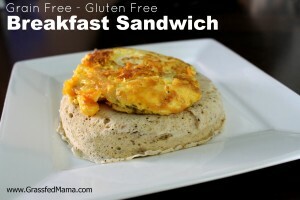 Here is my Grain Free Gluten Free Breakfast Sandwich recipe. Aidalyn loves this bread. She is my picky eater, so I am always trying to find recipes that she enjoys and are healthy too. I hope you enjoy this easy Gluten Free bread for one, too! For Trim Healthy Mama’s this is a Satisfying bread. A quick Grain free - Gluten Free bread recipe you can even make in the microwave. Mix all the bread ingredients in a glass bowl (safe for microwave or oven). Cook in oven at 350 degrees for 7-10 minutes or microwave for 2 minutes. Note: Can Substitute 3 tablespoons of egg whites if you don't have eggs. I pinned this for later! Thanks! I wanted to let you know I tried your THM friendly sausage gravy and my family and I agree that it was GREAT!!! Thanks! Awesome!! It’s a favorite here too. I’m so glad you liked it. I’m a sucker for breakfast & brunch recipes. Thank you so much! It is a favorite in our house too. I’m so glad you liked it! I’m a sucker for breakfast and brunch recipes. Thank you for checking me out! I use the one serving recipe more often than you would think. My daughter will want a “cake” and I’ll use it with a little agave nectar for her. She loves it. Could I sub the almond flour for a different grain flour or even coconut flour? You can bake it in the oven for sure – I would try to double the recipe and bake it at 350 for maybe 25 min and then check to see if it needs to go longer. hey this looks great but I don’t know where to get coconut flour… I don’t think we even have that where i’m from. are there any substitutes? Just made it! It’s great! The only thing I changed is adding a teaspoon of flax meal (for nutrition, texture and color). It tastes like bread and is sooo easy and fast. I will make it often. Thanks! Oh yay!!! so glad you enjoyed it! Is this considered S, E, or FP? S – Thanks for asking!